Is Training Really Worth It? Different manufacturing companies and different philosophies when it comes to the importance of employee and workforce training. Some see it as a headache and only address training needs when there is a problem or when they are required to provide training to receive safety credit or are mandated in some way. Other companies are much more proactive. They are actively looking for ways to improve, inspire, increase productivity, and raise the overall level of knowledge and capability of their workers. What kind of company are you? What kind of manger or supervisor are you? If you are in doubt about the importance of training and improving the skill of you workforce take a look this article from Dan Wibbenmeyer at Swoosh Technologies and maybe you will see things differently. The Ohio State University’s Center for Design and Manufacturing Excellence (CDME) was recently awarded a contract from the Ohio Development Services Agency (ODSA) and the National Institute of Standards and Technologies (NIST) to support the growth of small and medium sized manufacturing companies in the southeast region of Ohio. The contract establishes CDME as a Manufacturing Extension Partnership (MEP) affiliate for the State of Ohio in support of Ohio companies. 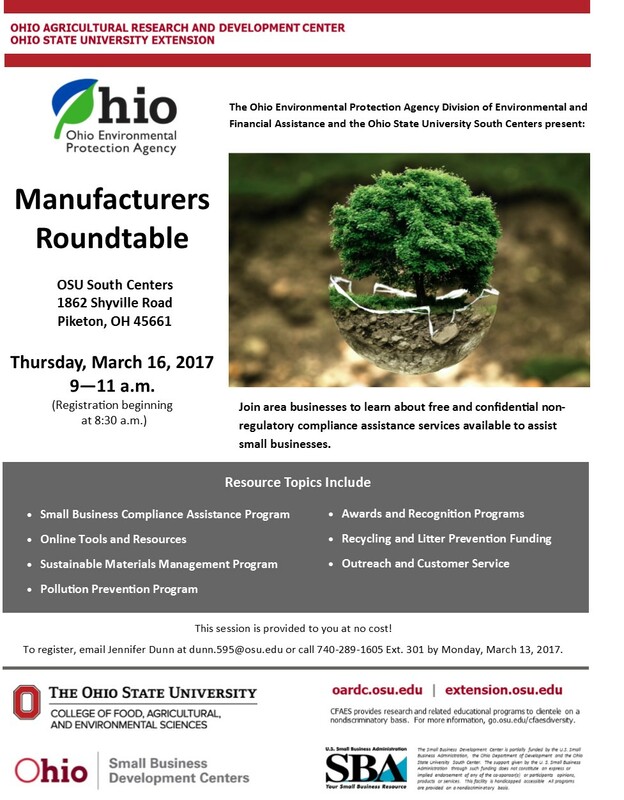 CDME will partner with the Ohio State University South Centers Business Development team to implement services in the Southeast Ohio region. The MEP at Ohio State will focus on providing value added CDME has a full-time engineering staff and is led by a team of former entrepreneurs and business owners who have successfully grown manufacturing and product innovation companies. The MEP program has access to CDME’s 40,000 square foot manufacturing space on the main Columbus campus, as well as most of the equipment in the broader Ohio State University landscape. Providing value-added engineering support for product development and innovation with an emphasis on design for manufacturing. Commercialization support and partner opportunities with commercial OEMs. Professional program management and industry-friendly contracts. Proposal identification and development support for federal, state and commercial funding programs. Access to the research capabilities and facilities of The Ohio State University and other State of Ohio research universities and federal laboratories. Introduction to support partners in the CDME network (incubators, venture capital, supply chain partners, fortune 100 OEMS, etc). Prototyping and small scale manufacturing of new products. Access to highly motivated students with experiential learning looking to join innovative manufacturing companies upon graduation. Mick Whitt, Business Specialist with the Small Business Development Center interviews Susan Foltz, Director of Manufacturing Assistance Programs with the Office of Small Business and Entrepreneurship, and Nicholas Dengel, Used Cars Manager with Glockner Superstore in Portsmouth. You have an idea, a great idea, something no one else has thought of, or you have an idea on how to improve on someone else’s idea. The problem is you don’t have the technical expertise or qualifications to turn it into viable business or even a realistic project. When it comes to technology, the good news is, there’s probably someone that can already do what you need done. It costs money but it can be done. The real fuel in technology is the idea and one of the most accepted and used forms of technology are apps. There is a good chance you are reading this very article on a phone, or tablet, that contains dozens and dozens of apps. Think long and hard….you just might have the next million dollar idea. Lean has been a buzz word in manufacturing for several decades and is now popular and useful in many industries. However, going through the process of lean training, implementing lean principles, and checking all the feel-good boxes that make managers and supervisors think they’re making a difference isn’t enough. Whether a company is implementing lean principles for the first time, or has been practicing it for many years, the mind set of lean is what creates the most impact. Here is an excerpt from Jim L. Smith’s article “Face of Quality” in Quality Magazine. “Quality at the source (QATS) has been used well before lean manufacturing became so popular. Many people in the quality function have applied the principles especially at critical work areas to detect nonconforming items and prevent them from moving forward in the process. If not given proper planning it can increase appraisal costs and disrupt material flow but as part of a lean initiative, QATS can produce dramatic quality improvements relatively quickly. Interview with Patrick Dengel, Mick Whitt, and Susan Foltz regarding business development and services provided by the Manufacturing Extension Partnership. See the OSU Live Streaming Channel for more business development information as well as other current genres at https://www.youtube.com/user/southcenters . If you are a business that would like to become involved with a job shadowing program for high school students please take to click on the link below for some great information. We are currently working with two Pike County, Ohio high schools to provide students interested in learning more about specific careers. However, if your business is located some distance from these schools, please contact us and we can put you in contact with the appropriate people to make job shadowing a reality at your place of business. This is great opportunity for the students to explore career paths, but it is also a chance for businesses like yours to meet the workforce of the very near future, and show them why your career is so exciting! Follow the link to learn more about Exploring Careers through Job Shadowing from thebalance.com. If you are not in a position to host students for job shadowing, forward this article to someone who is, or to a high school student that could benefit from this information. It is never too early to start preparing for the future! You may email me at whitt.124@osu.edu or give me a call at 740-289-2071 ext. 252.